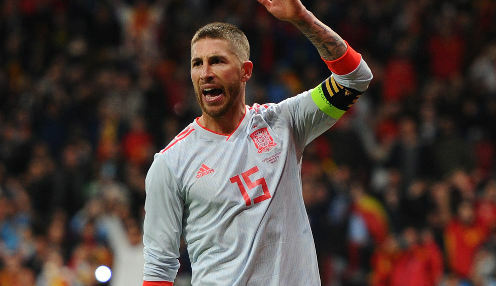 Sergio Ramos is happy with the direction Spain appear to be heading in after the Luis Enrique era started with a win in England on Saturday. The Real Madrid defender played an influential role for the La Roja at Wembley as the side came from behind to pick up a 2-1 win in their Nations League opener thanks to goals from Saul Niguez and Rodrigo. The result was a boost for Enrique who took charge of Spain after their disappointing World Cup campaign in Russia when they crashed out in the last-16 on penalties against the hosts. We've started a new era with a Coach who has a lot of experience, and what better way to win than at Wembley? And Ramos was left encouraged as he looks ahead to a new era for the national team. "We've started a new era with a Coach who has a lot of experience, and what better way to win than at Wembley?" he said. "Failure is when the team don't leave their souls behind, but tonight they gave everything." Spain are now set for an arguably tougher test when they host World Cup finalists Croatia in Elche on Tuesday night in their second Nations League Group A4 clash. Spain, who are 11/2 to win Euro 2020, are 13/20 to secure a second successive win, while Croatia are available at 11/2 and the draw is 14/5.